Aim higher with BBC Bitesize revision BBC Bitesize revision resources help you to break your revision up into manageable "bite-sized" chunks, aiding planning and time management. They also act as a structured pathway to the BBC Bitesize website, with links on the pages to videos, learner guides, worked examples and quizzes, BBC Bitesize gives you a richer, fuller, more varied and effective revision experience. Make every minute count with timed and trackable activities so you can get the most out of your revision and check your progress. Get the inside track on how the exams work with a detailed analysis of the exam paper, and exam-style questions on every page. Aim higher with full support for the top grades through worked examples and guided practice. Boost your knowledge with links to the BBC Bitesize website, getting you straight to the most relevant content. 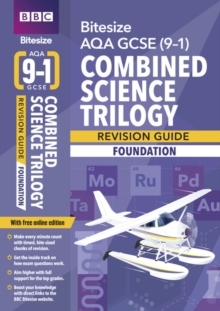 Matched to the AQA GCSE (9-1) Combined Science Trilogy Foundation specification.